I learned abut the AR sandbox almost 2 years ago and finally in May of this year I got to see it in action. For my son's senior project he set up an AR sandbox for the high school. 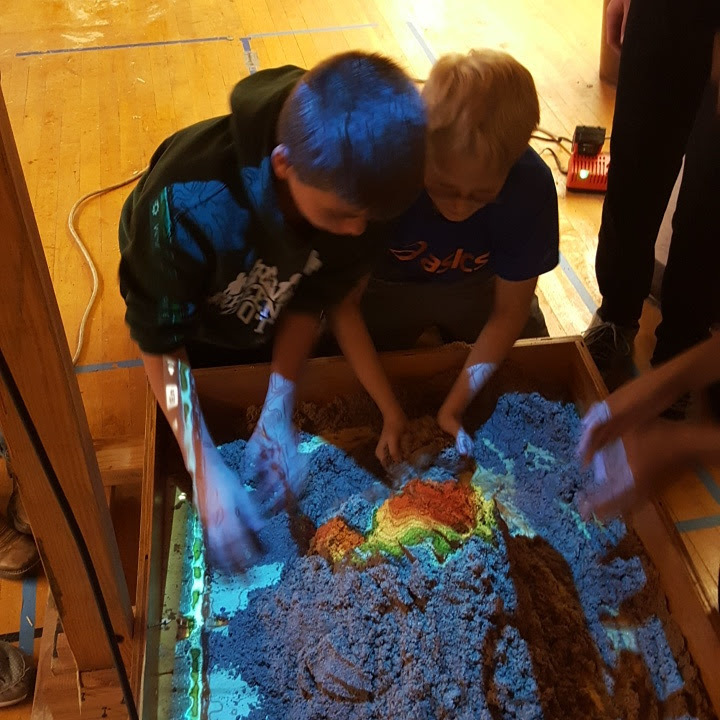 The original Sandbox prototype was designed and built by project specialist Peter Gold of the UC Davis Department of Geology. The driving software is based on the Vrui VR development toolkit and the Kinect 3D video processing framework, and is available for download under the GNU General Public License. Using this software, a Linux based computer, a short throw projector, and a Kinect 3D scanner he was able to make the AR Sandbox a reality. 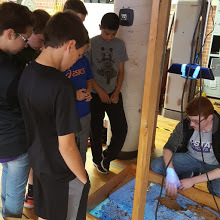 My STEM students were one of the 1st group of students to tryout the AR Sandbox. Let me tell you they fell in love instantly. As they were busy building different land-forms my teacher mind was jumping up and down. What a great way to visually see a topographical map. My students that have to get all hands on deck building the different elevations would love it. My students that are visual learners would also love seeing the elevations form. My 1st thought was what if I gave two groups of students two different printouts of a topographical area and have them build them next to each other in the sandbox. They then compare how they were able to build a certain elevation. They also can compare how different and or similar their two elevations are. My mind then went to having my students build different mountain ranges and compare their elevations. I would then have them discuss the weather on the mountain rages, the animals, and the foliage and why some mountains tops do not grow any kind of vegetation. Talk about seeing the world from a different perspective. how the AR Sandbox works. 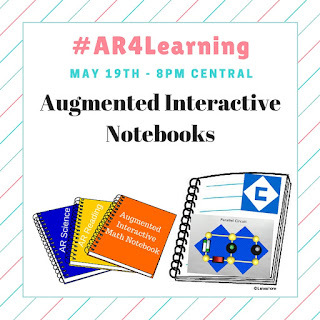 Join us on June 2nd 8pm central as I share how you can create your own AR sandbox among other fun augmented tools you can use with your students. What most people do not know is that my 1st day of teaching was my oldest son's 1st day of kindergarten. He have shared 13 first days of school, 13 Christmas breaks, 13 Spring Breaks, and 13 Summer Vacations together. When I was 18 and planning my future teaching as a career wasn't even on my radar. I wanted to travel the world and do something in international business. I was really good at using the computer and showing others how to use this new thing called "email" and the "internet". A year into college and going after my dream I met my soon to be husband who changed my world. After we married our son soon joined our lives and that was the moment we decided that one of us needed to be there for him, so I changed gears and went into education. I not only was able to have pretty much the same schedule as him but I also was blessed to be one of his teachers, not once but 3 times. As I reflect the times we shared while at school, it will be the surprise popping into my classroom just so he could say "HI Mom" I will miss the most. When he was in kindergarten and first grade he would tell the teacher he needed to use the bathroom and he pop his cute little red head in my doorway and say "Hi, mom. How's your day?". He would surprise me all the way through high school popping in just to say hi. On his last week of school I was thinking about how much I was going to miss him popping in and just then there he was standing in my classroom. Who would have thought I would spend my first 13 years in education sharing it with such a wonderful young man. He has been my inspiration and I am sure he will continue to be. 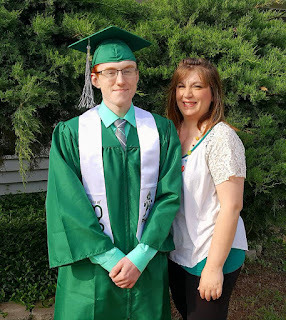 He plans to continue his education and small part of me is a little sad that I will not be there to share his experiences while the other part of me is so proud of him. He was accepted to the College of Engineering at Kansas State University before he even started his senior year of high school. His major will be Computer Science with a minor in Cyber Security. He also plans on working towards his masters in Computer Science. On his last week of school he received the letter he wrote himself when he was in the 7th grade. His major goal when he was 12 was to learn how to code and program while attending college and getting a degree in computer programming. I am so happy he is following his dreams. The hardest part of watching him follow his dreams is letting him go. At least I have 8 more weeks to enjoy his sweet face before he goes off to follow his dream. I am also pretty sure when he pops in from now on just to say HI I will treasure it even more. The Model-Ters have just completed the Model T Challenge with Kevin Honeycutt. 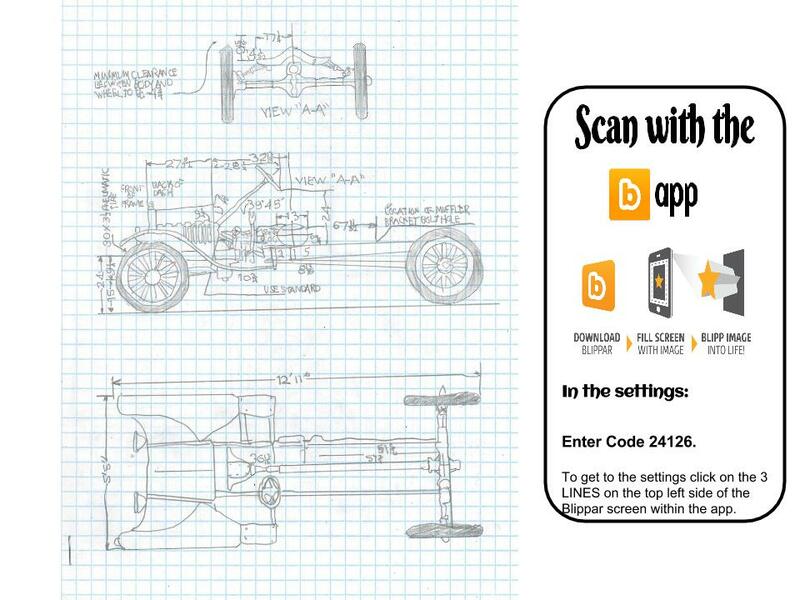 Kevin encourage teachers to get their students together and build a Model T to 1/3rd scale. I partnered up with three other schools and together we built a 1/3rd scale model of the Model T 1916 C cab truck. To promote and share our project I augmented some of the students' drawings. 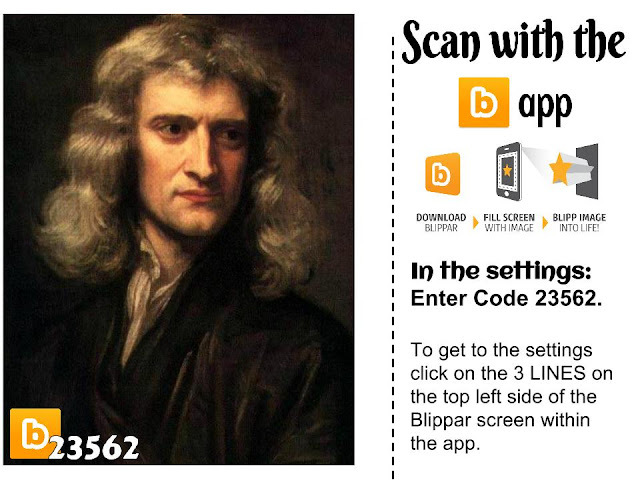 You will need to have the Blippar App and enter the code "24126" in the app's settings. Augmenting students' work is a great example of using augmented triggers in education and a great way to personalize learning. 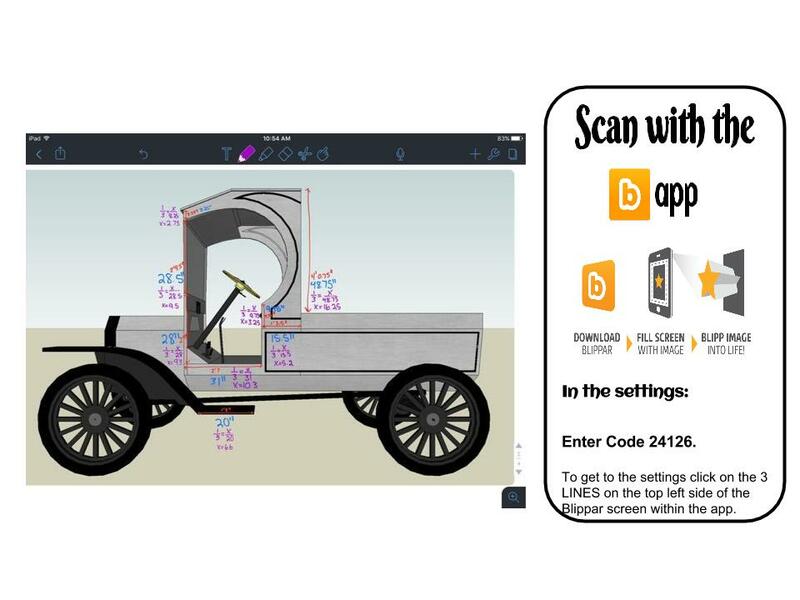 With these triggers you will be able to see the process we went through as we collaborated, designed, problem solved, and built this Model T. You can also follow the hashtag #modelTchallenge on Twitter to see how other schools worked together to complete there part of the challenge. I am very proud of my team and their students. Everyone did a fantastic job. Thank you Amber, Jessica, and Peter for joining me on this journey. I've learned a lot and enjoyed working with you and your students. Maybe next school year we can do another project together. 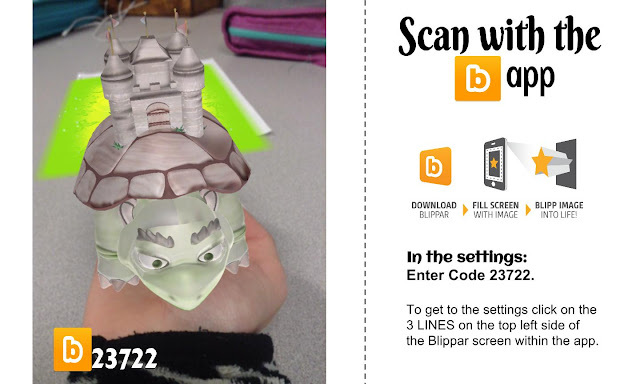 Augmented reality captures the attention of kids of all ages even the inner kid in adults. The 1st time I saw AR being used was at a conference and the speaker just mentioned how he used it to bring an art show to life. From that moment I was hooked and had to learn more. I've been sharing augmented reality content for the past six years. I started this journey presenting the topic at conferences, workshops, edcamps, and webinars. I love showing educators, parents, and kids ways to use augmented reality in education. Because I love to share I launched the Google+ Group "Augmented Reality for Education". My plan for the group is to share ways others use augmented reality in their classroom and with their students. It is also a place to get help and ask questions. To keep the conversation going I host a weekly Twitter Chat #AR4Learning. 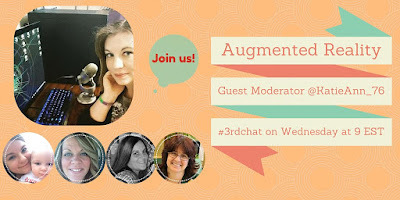 Once a month #AR4Learning is also Twitter Chat + a Google Hangout. 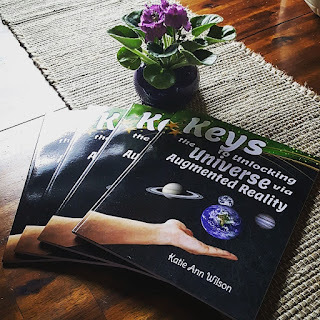 Since augmented reality can be used with all curriculum I have broken up the #AR4Learning Twitter chat into topics such as AR with Math, AR with Science, AR with Social Studies, AR with Reading, AR with Writing, etc..
My love of sharing has lead me to write a book "Keys to Unlocking the Universe via Augmented Reality". It has taken me about a year to put the book all together. 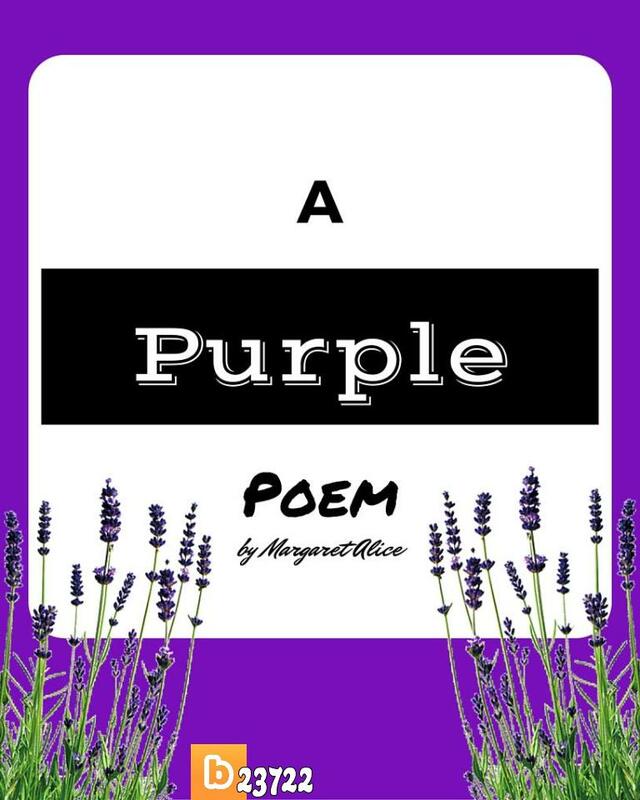 It is full of ideas on how to use all different types of augmented content in education, from augmented coloring pages to flashcards, and augmented 360 environments. To celebrate the launch of my book I will be giving away a digital copy on May 26th during #AR4Learning Twitter Chat + Google Hangout. 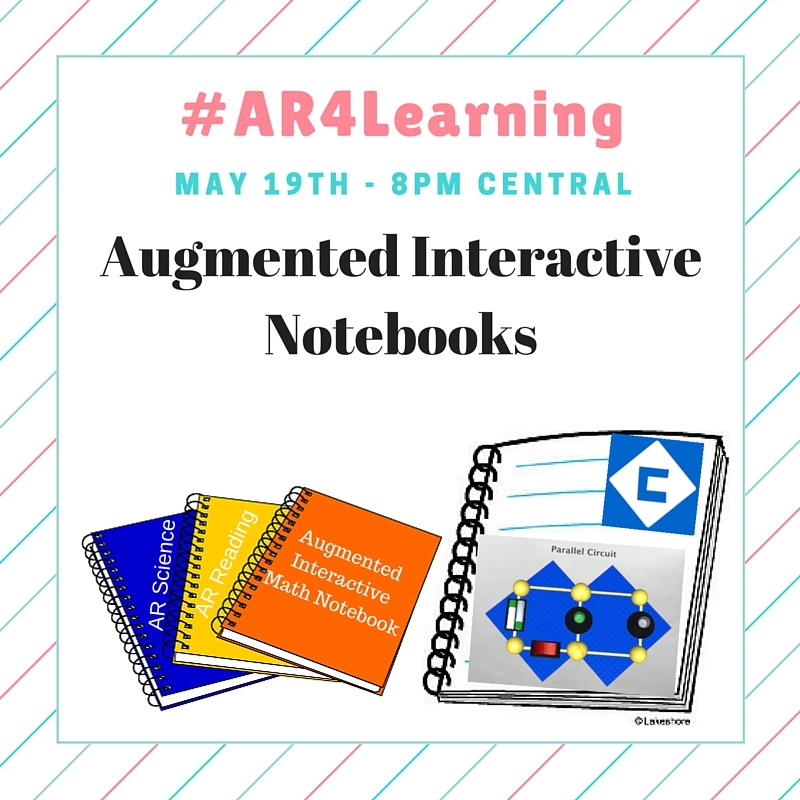 I may even give away a digital copy during the May 19th #AR4Learning Twitter Chat. To enter the give-a-way you will need to fill out the form below. 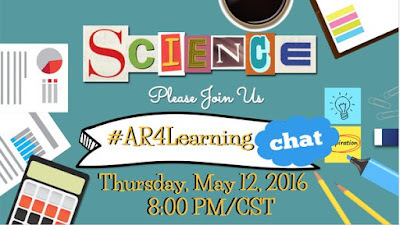 Then join us on May 19th and 26th at 8pm central time for #AR4Learning either on Twitter, in the GHO, or both. Did you ever wanted to know the background information of a play or musical? What about taking a peek into the behind the scenes? With augmented reality you can do those things and much more. Why not add a trailer to the program, a cast bio, behind the scenes, bloopers, facts about the program or important information. Augmenting a program or playbill will allow you to add those items. 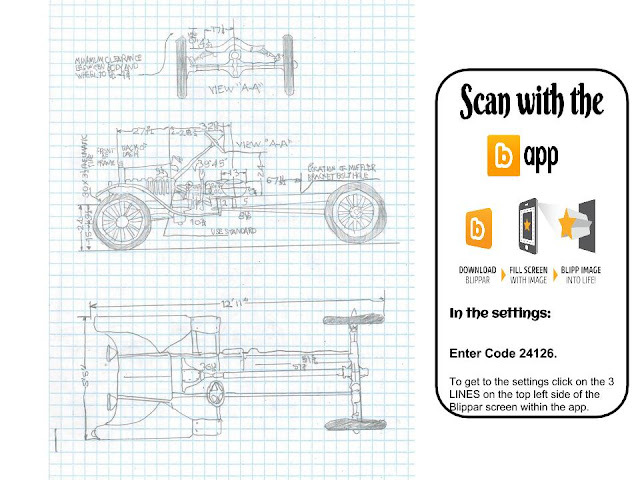 When a patron scans the cover they can access the digital content you attached. 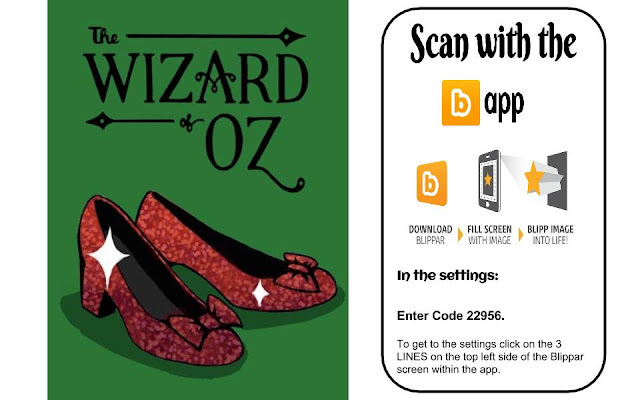 Try this example of an augmented playbill of the "Wizard of Oz". When you scan the image a trailer video clip will auto play. 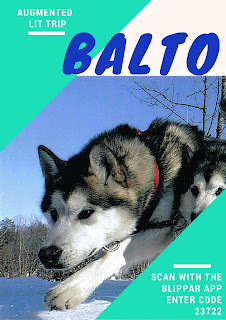 After the video plays you will have access to another video clip as well as some pictures. Just think of the possibilities. While patrons are waiting for the show to go on they can be learning about the cast, the musical/play/program, the original author, and so much more. Think about the printing cost to. In stead of printing a booklet you can print up a postcard. Don't forget to include instructions on how to access the content. Don't stop with just school musical, plays, and programs. What about augmenting a sporting program. How cool would it be to have live stats of a player and their bio. 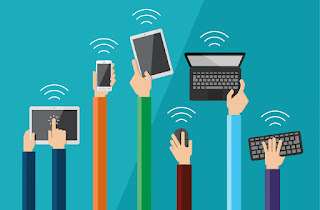 The possibilities are endless when it comes to creating augmented content. Join us on May 5th for #AR4Learning as we chat more about ways to incorporate augmented reality into the ARTS.